For many decades Aston Martin has been well known for its production of very prestigious, high performance cars. The history of Aston Martin really began in 1913 when Singer distributors Lionel Martin & Robert Bamford produced a car based on an Isotta-Fraschini chassis with a 1400cc Coventry Simplex engine. Lionel Martin achieved success with his cars at the Aston Clinton hill climb in Buckinghamshire, and this was how the Aston Martin name originated. After the First World War had ended the Simplex engined car was put into production and was to prove very successful in motor racing. Robert Bamford was to retire shortly after this and ownership of the company then fell completely to Lionel Martin. In 1925 racing driver A.C. Bertelli took over Aston Martin and went on to produce models using an engine of his own design. These cars continued to do extremely well in competition, and by the mid 1930's Aston Martin were highly regarded as a manufacturer of exclusive sports cars, achieving the ideals laid down by Lionel Martin some 15 years earlier. Car production was to resume after the Second World War had ended, but Aston Martin were now suffering financial difficulties and in 1947 the company was bought by tractor manufacturer David Brown. David Brown had this same year purchased Lagonda who held the rights to a 2.6 litre W.O. Bentley designed engine. New models were then built using this engine and the resulting cars were the first of the DB series of cars - the DB1 & DB2. The first completely all new David Brown car was the DB4. Launched in 1958 this used a 3.7 litre twin overhead camshaft, six cylinder engine, and featured beautiful sleek bodywork styled by Touring of Milan. The next Aston Martin, the DB5 of 1963 was to become well known to many by its appearance in the hugely popular James Bond films of the 1960's. More new models were to follow including the first Aston Martin to receive a V8 engine, the DBS V8 which arrived in 1969. The DBS V8 continued in production alongside the 6 cylinder DBS until it was replaced by the AM V8 in 1973. During the 1970's sales of Aston Martin were slow and no doubt things were not helped by the fuel crisis which Britain was experiencing at the time. Sales picked up again with the launch of the 170mph AM V8 Vantage in 1977. David Brown sold Aston Martin in 1972, and from then on until 1987 when it was purchased by the Ford Motor Company, it went through many changes of ownership. Today, still owned by Ford, Aston Martin is enjoying great success with the new DB7 and more recently the V12 engined Vanquish model. The beautiful and very exclusive Aston Martin DB4 was launched in September 1958. It went on sale at the price of £3976, or to put that into some perspective about seven times the price of a Morris Minor. The Aston Martin DB5 was launched in 1963, and was a development of the previous DB4 model which it replaced. Available as both sports saloon or convertible. 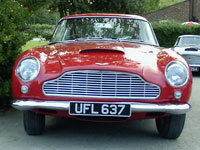 The Aston Martin DB6 was launched in 1965 to replace the DB5. The DB6 shared the same running gear as its predecessor and was also quite similar in appearance.